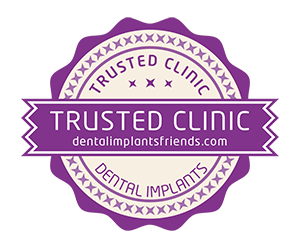 We are delighted to offer our patients a new dimension of comfortable dental treatment abroad. It is crucial to receive high quality dental treatment at INDEXMEDICA, but it is also important, to have a comfortable and pleasant place to stay in Krakow. 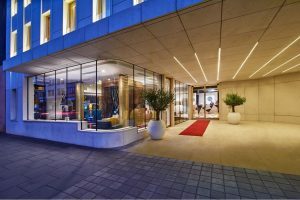 By offering our patients two hotels in 4* standard - INX Design Hotel and Metropolis Design Hotel we have achieved a new level of patient care. We are proud to inform that our offer is unique on the Polish market. 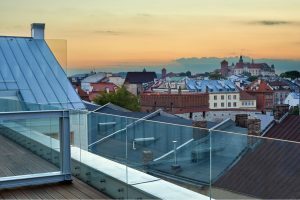 INX Design Hotel**** - opened in August 2017, is located in one of the most recognisable districts of Kraków – Kazimierz. 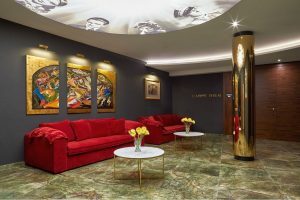 Our hotel is an excellent choice for guests who value art and cultural pursuits, but also those who enjoy design, leading a healthy lifestyle, rediscovering memorable places, meeting new people and exploring history. Our patients enjoy staying in this hotel. 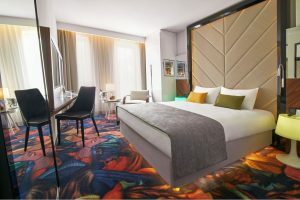 INX Design Hotel**** features 118 comfortable rooms, which are brimming with energy and inimitable design, and 4 exclusive and terraced apartments with a view over the Royal Wawel Castle, the synagogues of Kazimierz, the Wielickie Foothills and the Beskidy Mountains. An excellent place to stay in a pleasant and informal setting. The colourful interior of Negresco Bar is a friendly hub where both hotel guests and the residents of Kraków like to catch up on some rest. Settle down in a comfy armchair and enjoy the aroma of an espresso or relax with a drink. 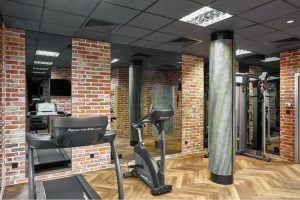 As our guest, you have access to our small but very well equipped gym located on the hotel's lowest floor. A visit to the Finnish sauna will help you relax after a training session or a busy day in the city. 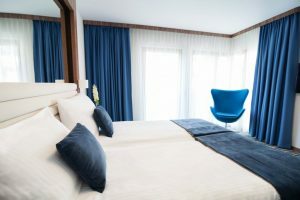 What is so special about INX Design Hotel? INX Design Hotel**** is located in the historic district of Kazimierz in Cracow. We are only a few minutes walk, along magical streets, near the Vistula river Boulevards. 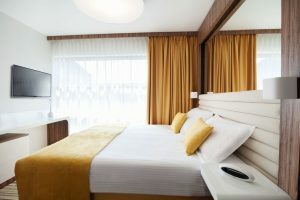 The hotel is situated only 20 minutes (by direct tram No. 24 from Wawrzyńca to Urzednicza tram stop) from INDEXMEDICA Clinic. 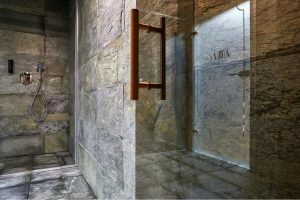 Our patients really enjoy relaxing in the exclusive INX Design Hotel**** after treatments at INDEXMEDICA. 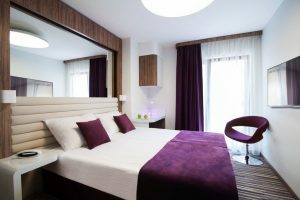 INDEXMEDICA offers its patients an exclusive hotel in the Old Town in Cracow, located near the clinic. Metropolis Design Hotel Sp. z o.o. SKA has been designed based on bold and sensual ideas. It perfectly captures the moment in which modernity combines with functionality. Visual pleasures are delivered by the juicy textures and furniture made on order. Every hotel floor is dominated by different color motifs. Metropolis Design Hotel Sp. z o.o. SKA features 60 esthetic rooms that emanate modernity and warmth. The materials used in the hotel match one another presenting unusual arrangements, whereas colors and deep tones enhance your mood. The varied distribution of rooms creates harmonious spatial compositions. The stylish and magnificent interiors together with a pleasant atmosphere make it a perfect place conducive to relaxation and meetings. In the privacy of the sunny terrace you can delight in exquisite cuisine that is served here. 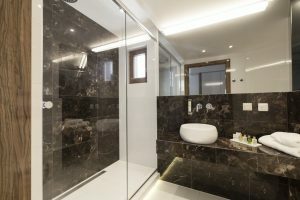 What is so special about Metropolis Design Hotel Sp. z o.o. SKA? 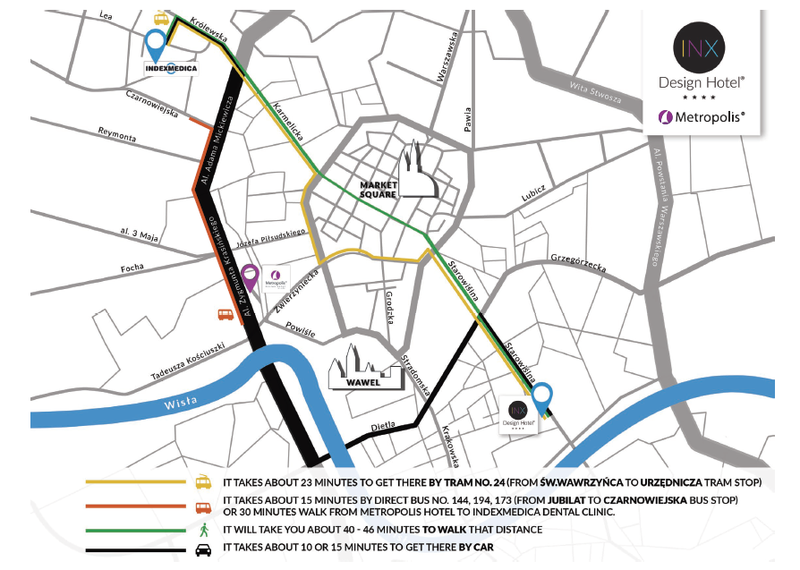 How to get to Metropolis Design Hotel Sp. z o.o. SKA? Metropolis® Design Hotel Sp. z o.o. SKA is located in the heart of the Old Town in Cracow. 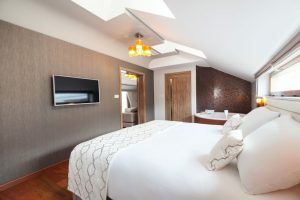 We are only a few minute walk, along magical streets, away from the Vistula Boulevards, the Wawel Castle, the Main Square and the mysterious nooks and crannies of the Kazimierz District. The hotel is situated 2 km from the INDEXMEDICA Clinic. 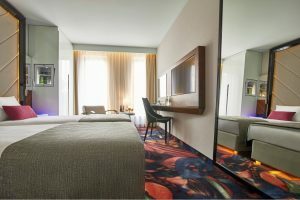 Our patients enjoy resting after treatments in the exclusive Metropolis® Design Hotel Sp. z o.o. SKA! 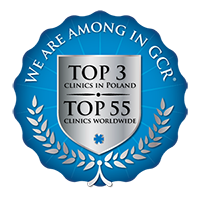 INDEXMEDICA cooperates only with selected hotels in Kraków. All hotels we cooperate with, offer our patients a very good standard and also attractive prices and special offers only for our patients, if you book a room via INDEXMEDICA office. It is important to have a nice place to relax after the dental treatment and to see the city. All hotels are located in the center of Krakow and/or in the Old Town area with many tourists attractions. Sodispar service apartments are in Krakow top 20 hotels by TripAdvisor . Sodispar Krakow apartments are situated in the most central areas of the city, next to main tourist attractions, shopping areas and entertainment establishments. This homelike accommodation is a splendid alternative to pricey hotels. Discover a comfortable and affordable way to experience Krakow from an insider's point of view. All of the flats are fully furnished self-catering apartments with private bathrooms and basic kitchen appliances. Freedom and easiness of independent accommodation comes together with excellent service and professional assistance whenever necessary. 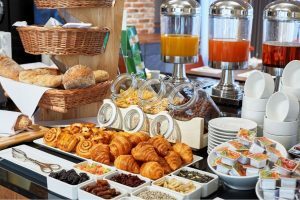 What makes Sodispar so different from chain hotels and so beloved among our guests is our flexible and individual approach to each customer. We always do our best to suit your individual needs - express your wishes and expectations and we will suggest an offer most suitable for you.